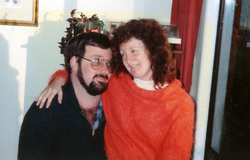 Hi, my name is Cherie and this is my best friend, soulmate and husband of 25 years, Butch. Butch passed away in September 2008 after a cancer journey spanning two and a half years. He left a humungous hole in my life that I feel will never disappear. During my expedition into grief, a relatively unchartered territory for me, I have tried to work through my grief and 'get over it as per society's expectations of me. I have found out that grief is a unique individual journey that doesn't come with an instruction book or a due by date. Recently I discovered websites created by widows/widowers, and maybe it's my perception, but I felt I was 'too old' to contribute. Too old in the sense that some of them were for young widows/widowers and being forty seemed to be in a different class of it's own (I'm forty-eleven this year) and also in the sense that they were all recent widows/widowers. Here I am almost three years later and it still feels like yesterday my life was tipped up on its end. I decided I needed to address this perception for myself and create a website where I could, maybe, connect with 'grievers' who were struggling to come to terms with their grief, with moving forward and well, I guess learning to live again. This website is about meeting up with others who have an understanding of what losing a loved one is all about and need someone to talk to, share ideas and eliminate this feeling of isolation that can be part of a grief expedition. Grief isn't restricted to any particular age group or to just the passing of a partner, and neither is this website!